Earning Thousands of Naira or Dollars from your Blog is not impossible. But there is a popular saying that you must "Learn before you Earn". Popular bloggers like LindaIkeji, Neil Pathel, and Ramit Sethi all turned their hobby (blogging) into a source of full time income so why can't you? Of course they were lucky, but they worked hard for it. They all started small just like you are now but passion and hard work made the difference. In the course of this write-up am going to introduce you to some strategic means of monetising your blog, at least you should start earning the running cost of your blog for now. Now, am going to show you 5 easy ways you can monetise your blog or website. 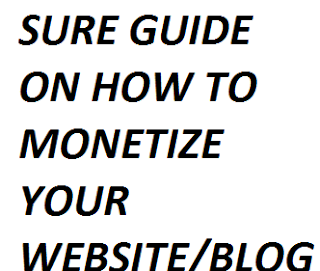 Pay close attention to this guide as making money from your blog isn't a cake walk. Google's Adwords allow Advertisers to show their goods, product, services or websites on search results. In order to make this happen, Google launched adsense which allows publishers (website and blog owners) to serve and run adverts on their sites from the advertisers. Google Adsense is in fact the best Ads network and very strict. After sign up, Adsense displays adverts that are relevant to your website contents. You generate revenue from impressions and per clicks. Its easy to make hundreds of dollars monthly from Adsense but you must not violate any of the Adsense policies. Google will ban you immediately the sense you are clicking on your own Ads. If you are very good at what you blog about why not create an e-book on that particular niche. Are you a pet blogger? Then you can write a detailed e-book on pets breeding and training. There are lots of people out there who are willing to pay for these e-books if its of good quality. This is quite easy to do but the major issue you may encounter is marketing these products successfully. Another issue you may encounter is the mode of payment, yes! how would customers pay for your products? But if you can find a way out of these little hitches then you are sure going to earn a fortune from your e-book. Perhaps you must have seen a product in an online shop and you recommended it to a friend. Why do this for free when you can actually make a fortune from it? You may gulp as high as 40% of a product from your affiliate link when someone purchases a product through you. Its pretty cool when you get a $50 share from a product that costs $150. Right? Do you have regular site visitors and an empty side bar on your blog or website? You can make a fortune from this. So many start ups are out there looking for popular blogs and websites to advertise and promote their services. You get paid as per how many people viewed the advert. Most times it goes for $1 for a thousand impressions. That’s not too bad right? All you need do is to make use of any of the popular adservers to monitor the impressions on the adverts placed on your blog. This is one sure way of making money from your blog/website but it demands your site have page authority. This is a bit wide and I have decided to make it a topic of it’s own. I have blogged about it HERE so you can just read more about it. Hope I have been able to give you solutions to your questions on how you can earn from your blog? If yes please share and let us have your thoughts on the comments section.